The letter arrived in a hand-addressed envelope from the Travis County Corrections Center. While I didn’t know the author her words cut deep to my core. On the outside of the folded letter she had written in bold letters “I praise God for you”. My heart was pricked by her words. I thought how could a woman who has been behind bars for almost a decade say she is blessed by a radio station? I had a hard time getting my head around her sentiments. 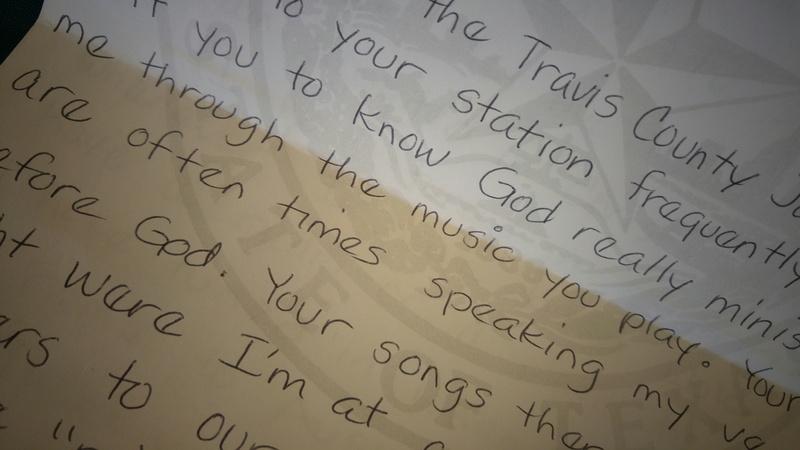 “J” the inmate, wrote that she listens faithfully to the Christian music radio station that I work for from her cell room. She said the the songs we play speak to her at just the right time and that the words of the DJ’s encourage her everyday. Oh what it must be like I thought. So desperate, so desolate it must be to live out such a sentence. But J had something else in mind. When she’s given access to a radio she tunes in to the station and said that the music IS her church. J wrote heartfelt words and expressed how she has found great hope and joy through Jesus and that the lyrics to the songs she hears releases her out of fear, anxiety, and worry. Thankfulness poured out on to the Travis County Correction Center letterhead as she thanked us for lifting her broken soul. She pressed on and said it’s the music that reminds her that the Holy Spirit is with her and she praises God and worships in her cell along with the music. Like a grenade to my heart she said she’s quite alone in the world and I wondered to myself how one can have faith and gratitude this big being behind bars. When I look at my world, my emotions can hang on everything going my way and when it doesn’t I’m out of sorts. J’s letter quickly shifted my perspective. Her words were inspiring. But above all her faithfulness spoke so loud. When all is lost and your future is dim how do you muster this kind of faith? She closed her note by saying that she knows Christ died for us here on the bottom shelf of life as much as He did for those who are easily seen on the top shelf of life’s store. Her letter left me wanting to fight like crazy to fan the flames of life with my faith, just like J.
Sweetness! We never know who our words or actions will encourage. Thanks for sharing this precious woman’s letter. Tracey, this is beautiful. The story of Js faith in jail is yet another reminder of how Jesus sustains us through seasons of trials and suffering. Thank you for sharing!